You may recall we reported that Comic #1 for 2006 was in the mail. Today, BZPower Forum Assistant -Kex- has provided scans of some of the more interesting pages in the comic. 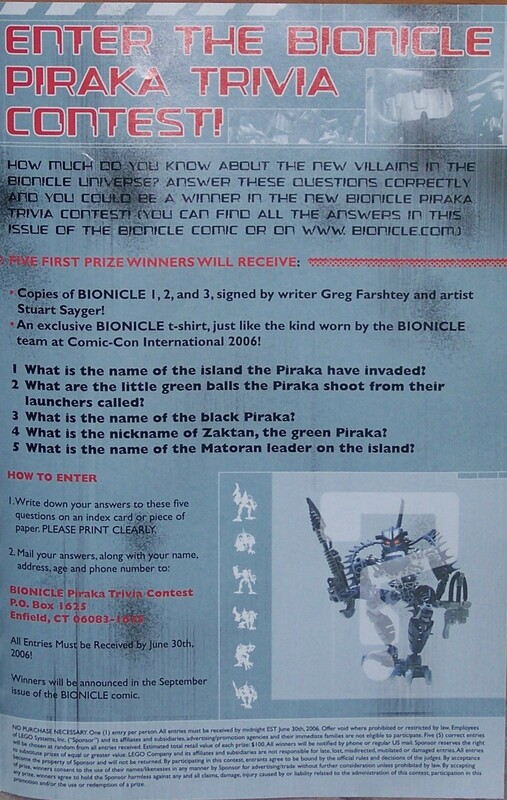 There is a Piraka Trivia contest with five questions (the answers to which have all been known on the forums for a month, at least). Five correctly answered entries will be randomly chosen to win. For images of the details and scans of other noteworthy pages, read on! 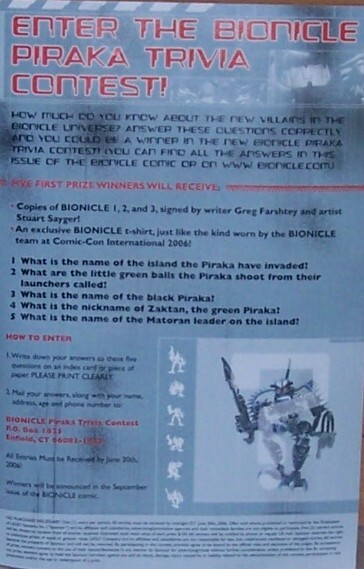 Here is the ad for the Trivia Contest: small size, large size. 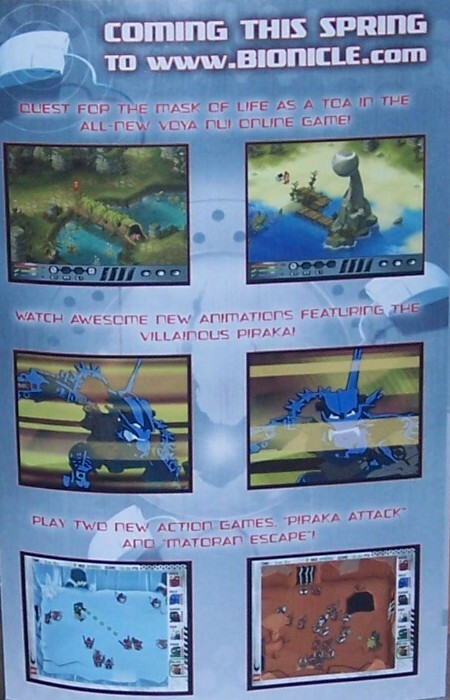 There is also an ad for the Voya Nui Online Game, bios of the two Voya Nui Matoran Combiner Rahi, and a neat-looking ad for Axonn and Brutaka. This Rahi bird is highly prized by the Matoran of Voya Nui, for it is completely invulnerable to the heat of molten lava. It hunts by diving straight into magma streams and feeding on insects that live in the lava. 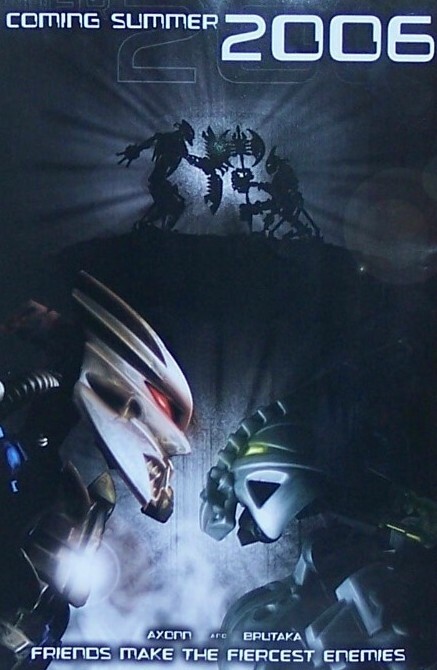 Matoran collect the metallic scales it periodically sheds from its wings to build craft capable of surviving passage down lava rivers. These spiders are often seen swarming out of the cracks in the earth, particularly in the forested "green belt" around the edge of Voya Nui. 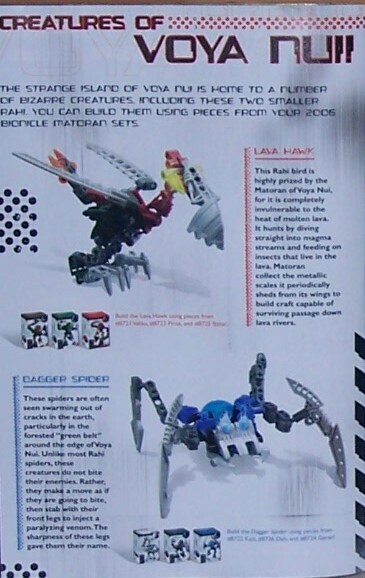 Unlike most Rahi spiders, these creatures do not bite their enemies. Rather, they make a move as if they are going to bite, then stab with their front legs to inject a paralyzing venom. The sharpness of these legs gave them their name.